There isn’t anywhere near enough snow to hold a snowshoe race on the Curly’s course this Sunday 1/29. RD Paul Bazanchuk is checking with the MA DCR to see if it can be rescheduled for Sunday 2/12. Check the “other races” page on our site for other options this weekend… some may actually have snow. I’d like to take a moment to recognize Dave Dunham, who has been working behind the scenes compiling the series scores for each season for as long as I’ve known about it (and probably longer tha n that.) After each race Dave sends along a list of milestones reached for a variety of factors (number of series races, overall points, number of wins, etc.) While we don’t always note these here or in the email updates, they’re always posted on our site on the Milestones page. Dave’s a strong competitor in both running and snowshoeing and we really appreciate the time he spends helping us with our series. Thanks, Dave! Trail Race or Snowshoe, HILLS Were Climbed! 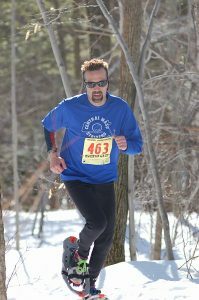 Series Race #4 took place on Sunday 1/22 at the Mt Tom Reservation in Holyoke, MA, with the 1st Annual Western MA Snowshoe Scramble – the only hitch being a complete lack of snow, resulting in two fairly challenging trail races. 13 runners ran a single 5k loop, and 27 tackled a 2nd time around for 10k. The course climbed steadily for about a mile and 500 ft of gain, then later dropped even more rapidly to finish where it started, on trails that sported an abundance of rocks, roots, and in some spots ice. Drew Best and Apryl Sabadosa were the first runners to complete the 10k; the 5k was won by Melissa Cooney and Brian Donoghue. Best of all, the rain held off until all the runners had finished! Results are posted here and on Coolrunning.com. Photos courtesy of volunteer Sam Harding can be found here. Many thanks to RD Carolyn Stocker and her crew of volunteers for all their hard work to make this race happen! While not a series race, a number of our regulars opted for snowshoes on Sunday and headed to the Oak Mountain Ski Center in Speculator, NY for their annual Oak Runner 5k/10k races. Oak Mountain is primarily a downhill ski area, so runners here were also treated to some lengthy climbs and steep descents. Results of both races can be found here, with photos available as well: album 1 , album 2, album 3, & album 4. It’s going off as scheduled as a trail race – there may be some icy spots so bring traction aids (microspikes, yaktrax, or my personal preference, screwshoes) just in case. Unless you have not guessed it, the WMass Snowshoe Scramble this Sunday, Jan. 22nd at 10am is going to be held as a trail race. As of now, the course is still subject to change but due to conditions there is going to be a ~3 mile loop that you can choose to do 1-2x. Expect trails to be icy in spots and if you have not run at Mt. Tom before, trails are technical and hilly. Also please remember to bring a dish to share if you are able. There will be an after party celebration at the Northampton Brewery to enjoy some local brews. Also thank you again to our sponsors: Dion Snowshoes, Northampton Running Company, Dunkin Donuts, Deals & Steals, Berkshire Brewing Company, Drink Maple, and the Black Swann Inn. If you have any questions, comments, or want to volunteer please email me at cstocker@springfieldcollege.edu. Prereg available until 5 PM on Saturday 1/21; race info can be found here. Also, if anyone is desperate to race on snowshoes this weekend – word is that Moose Mountain in NH on Saturday and Oak Mountain in NY on Sunday will be snowshoe events.